We have the best NYC Party Bus! Looking for NJ rentals? We go to NJ too. Windows - Why would you want to hide behind tinted glass in a normal party bus rental or stretch limo? You are in NYC! People everywhere will see you and wish they could join the fun. Alcohol - Our trolleys are BYOB so you can bring whatever you like onboard - wine, beer, hard liquor, your choice! Seating - Our 34 passenger party bus is special - the front half of our trolleys have perimeter seating creating a more social atmosphere and opening up space for a dance party! Uniqueness - As opposed to normal NYC party buses or limo service, our trolleys are Instagram-worthy and stand out on the streets! They are the perfect setting for your large group celebrating specials occasions such as a birthday, pub crawl, bachelorette party, or just a regular night out! Request a Quote now to see our party bus prices! Hop-Off-And-On Service: hop-off and hop-on at any destinations within the New York City metro area. You choose your own route. We also travel to Long Island and NJ. Capacity: 34 people each and the front half of each trolley has perimeter seating that faces each other creating a more social atmosphere as opposed to charter buses or a limousine service. 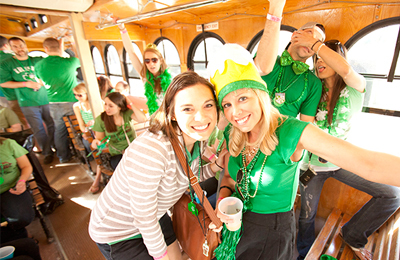 Your friends and family can also stand (and dance) in our trolleys as we have 9' ceilings. Check our interior photos on Our Trolleys page. Friendly, professional driver: You will love our drivers! They are punctual, fun, and will chauffeur your party to wherever you like. YOU are the DJ: You can play your own music on our surround sound system and it's seamless. All you need is a smartphone and a playlist.